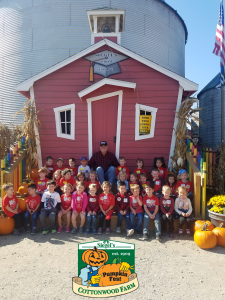 Farmer Paul’s educational talk with the children in a real grain bin about “how bees pollinate plants”, “where their food comes from”, and “what life is like on this farm”; which was established on this land by his family over 100 years ago! A Hayride through our real pumpkin field (weather permitting). 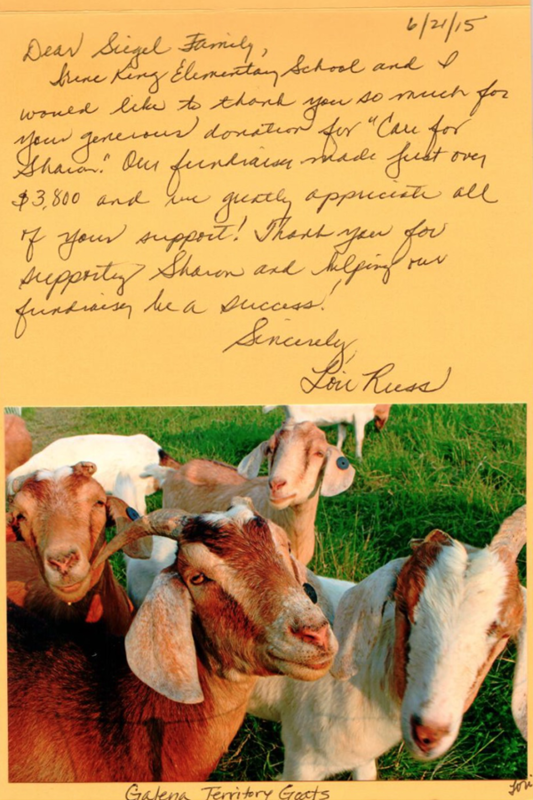 Farm Animal Area – Everyone receives a cup of feed for the sheep and goats! Watch the goats walk on the roof! Maybe there will be some new baby goats, piglets and calves too! See our newest arrivals in the Baby Chick House! Students get great exercise in 1 of our 5 play areas. Climb aboard the Pirate Ships in Port Cottonwood. Enjoy the “kid sized” barns in our Barnyard Playland. Play on the 48 foot long train in the Wheels of Fun Yard! Explore the Bird Houses & Covered Wagon in Kaden’s Birdie Barracks! Visit Maddie’s Mansion and Chalets Playland with the New for 2018 School House! Students will climb aboard and ride the Ghost Town Railroad! FREE use of our covered picnic areas for your snack or lunch. Space must be reserved when you schedule your tour. Our Country Store offers Fresh Baked Pies, Fudge, Apple Cider Donuts and fun items for adults & kids of all ages! Be sure to let your Chaperones know to visit Kyle’s Corn Crib Café for Coffee, Hot Cider, Fountain Drinks, Hot Dogs, Pulled pork, Pizza and more! October is National Bullying Prevention Month so Students will walk through Spookley’s Anti-Bullying Maze and signs placed in the maze tell the “Spookley the Square Pumpkin” story and its’ message of tolerance and kindness, appropriate for all children. The 1st 50 schools that book their tour will receive a FREE DVD telling the story of “Spookley” and his special message. Lexi’s Jumbo Jumping Pillows, the kid friendly Haunted Barn, Siegel’s Sports Zone and/or the Giant Mountain Slide is available for $1.00 each per student. A special kid-sized pumpkin for each paid guest as you exit (Please bring your own bags!). Each student will receive a wristband which is also a FREE ADMISSION PASS (a $15 value!) for one FREE child’s return admission to Pumpkin Fest! Wristbands will be placed in teacher’s bag for distribution at school. This fun-filled educational tour is available for only $9.00 per student & chaperones. (Coupons cannot be used with school groups and “two and under free” does not apply to school tours.) Two teachers are FREE! A minimum of 20 students are required to book a tour, therefore, there will be a $180.00 minimum charge for tours with less than 20 students. In order to guarantee your tour date we require a $100.00 non-refundable deposit per class within 7 days. The deposit will be deducted from the total due on the day of your tour. Each year we sell out a little earlier, so call today to reserve! All reservations are taken on a first come – first served basis. Note: All payments are due on arrival the day of your visit. In order to provide an enjoyable experience for all, plan on your visit to last 2 hours. If staying for lunch, 2 1⁄2 hours. We will collect and store your lunches upon arrival. We recommend marking their bags with student names. To start your tour as quickly as possible, upon arrival, please have the following ready before you exit your bus: 1) Your payment in cash, school check, or credit card. 2) The separate totals of students, teachers, and chaperones in your group. The student’s free wristbands are based upon these numbers. 3) If your group is arriving in cars separately, please gather as a single group. Have all monies collected by a teacher before entering. Our guides will assist and direct your group while you are here, so that your group will experience ALL of the fun and educational activities on our Farm! Looking forward to making memories with you this fall! Have your child celebrate their birthday with family and friends here at Siegel’s Cottonwood Farm Pumpkin Fest and give them a memorable birthday experience! There are lots of fun things for all of your party-goers to do here on the Farm! Take a look at what’s included with general admission on our Tickets & Coupons page. Click the link “Birthday Party Packages” to the right of the screen to chose your package. Please note you MUST call to check date availability. Party Procedures and Helpful Hints! We recommend that you eat upon arrival, so that you don’t have to spend a lot of time gathering up your entire group in the reserved picnic area. You may bring a Birthday Cake and Decorations, but no other food or drink. Have members of your group here 15 minutes prior to your scheduled time. Upon arrival please gather at the Admissions Window and check in. Give the attendant the total number of adults and children in your group. Don’t forget that although your time is limited in the reserved area, you can SPEND ALLDAY here on the Farm! All options require a minimum of 50 people. Mix and match any of the options above. A $500.00 deposit is due upon booking your reservation date. Balance due upon arrival. We can take a credit card payment via phone. Come on out to Siegel’s Cottonwood Farm with your team and challenge each other through the corn maze, Take a Hayride to the Real Pumpkin Field, Let off some steam in the 3 play areas and so much more. Don’t forget to pick out your special Brownie Patch before you leave. 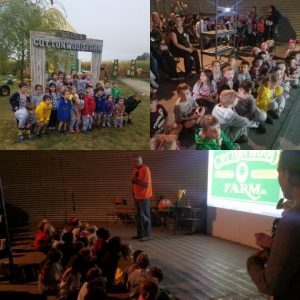 Boys Scouts and Girl Scouts come on out to Siegel’s Cottonwood Farm with your team and challenge each other through the Cornfield maze, Take a Hayride to the Real Pumpkin Field, Let off some steam in the 3 play areas and so much more. Don’t forget to pick out your special Scout Patch before you leave. 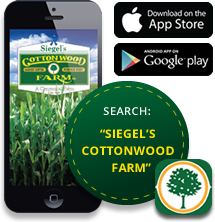 Clubs or groups of all ages will find Siegel’s Cottonwood Farm is an ideal location for fellowship and fun to spend a fews hours at.